VRBO/Ha started to hold security deposits (i.e they charge the renter sec dep but they do not deposit it into owner's account). I do not like that arrangement at all. I like to be in control of deposit instead of (potentially) having to prove damages to HA in order to collect from deposit. So I was entertaining the following idea. 1. set up VRBO with "security deposit not required". 2. Disclose in VRBO listing that sec dep will be required by a cc and will be collected 3 days prior to arrival. I have done some testing and it seems I am unable to set up a link for sec deposit UNLESS I enter guest's card number. But i want to have THEM enter the card number when they receive a link. P.S. I do not collect sec dep in a form of CC auth for my OR bookings - I have it as a nontaxable "surcharge" that I later refund. So i do not have sec dep enabled globally. So is there anything i am doing wrong here? That is preventing me form being able to send them a link where they can enter their CC for sec dep hold? Yep, it's never good to have a third party in charge of the damage deposit. I've seen people doing exactly what you describe with stating the secdep in the house rules and it works well. Sending the link should work as long as you go into the booking Rules and enable the secdep there. That's probably what's tripping it up right now -- you have the secdep off for the property, so the booking Rules default to that. But you can change that on a booking by booking basis. Set it to "automatically reserve a security deposit" even though it won't actually be automatic in this case, and fill out the details. Leave "Security Deposit Reminder" set to "do not send an email reminder" because you'll be sending your own 3 days before arrival. Once you do that, the security deposit link will be enabled for the booking and you can send it to the guest. Make the change on the booking Rules, not the property Rules. You'll have to do that for each VRBO booking as it comes in, but that way it'll apply to only that booking, not the rest of the direct bookings etc. Got it thank you so much! Are you looking at the payment form or the security deposit form? The security deposit form should always only allow credit card or PayPal. EDIT: I looked up above and the point is to give a payment to get the card and then schedule the security deposit on that. 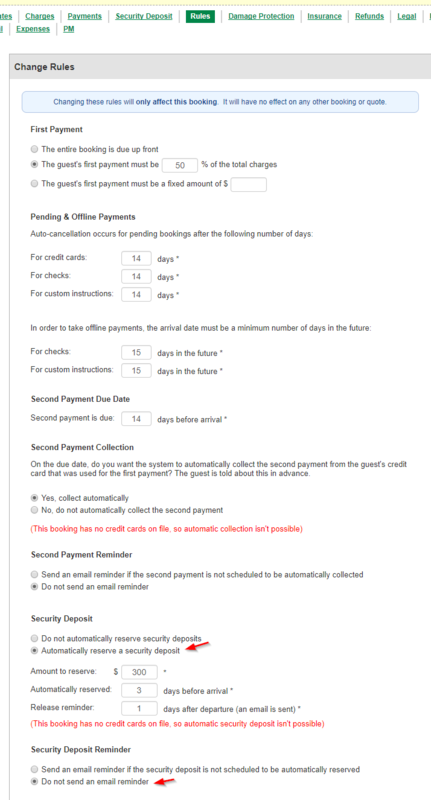 If you want to hide the check and custom instructions on the payment form, go to the booking Rules tab and set the payment days in advance for Check and Custom Instructions to a few hundred so they will never apply. That way they won't show. FYI, we're currently working on an enhancement for this process that will make the secdep form smarter. Once that's released (due in the next week or so) the secdep form will check the due date and schedule the secdep on the card if it's not due yet -- instead of instantly charging.